Asian LNG portfolio positions are driving a shift to shorter term contracting and a greater focus on the influence of US & European hub prices. 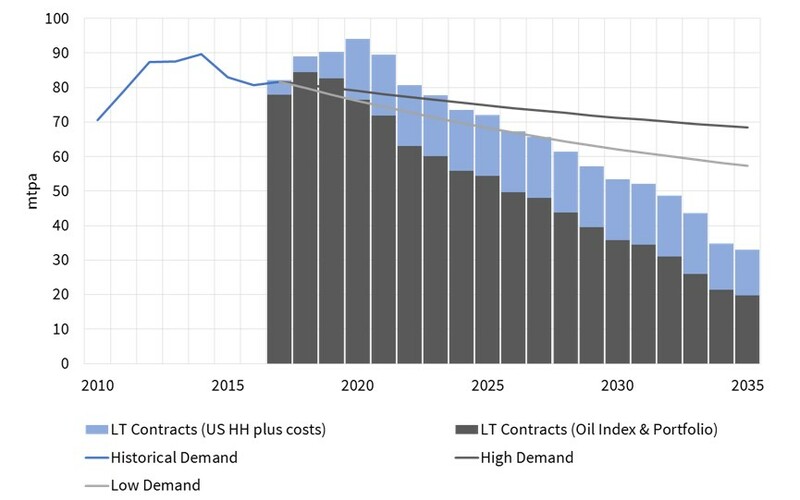 Low demand – where a significant surplus of LNG emerges vs contracted positions by 2020. 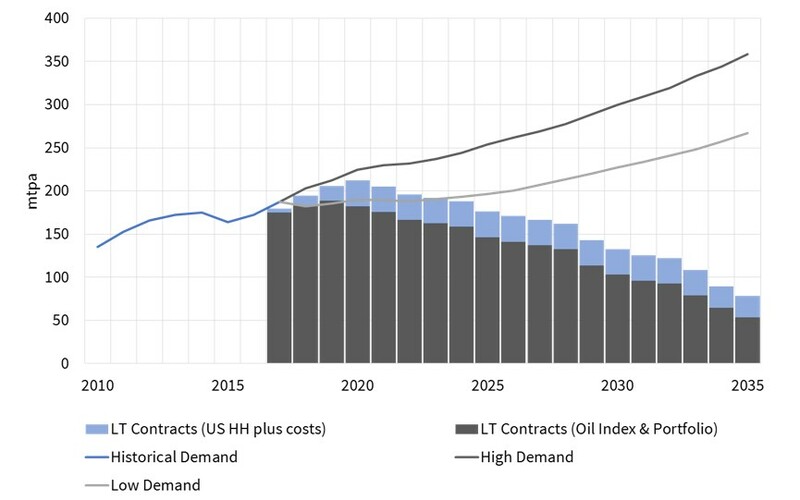 In either scenario the LNG market needs substantial volumes of new supply in the first half of next decade. But it is the pace of Asian demand growth that will determine whether new LNG will be required by 2020-21 or 2023-24. This timing is key given a hiatus in new liquefaction project FIDs and 4 to 5 year lead times to bring new supply to market. To date there has been limited willingness by either producers or buyers to invest or contract in anticipation of a high demand scenario. In the meantime, Asian portfolio positions are helping to drive a rapid evolution in the way LNG is contracted. Over contracted buyers are selling surplus volumes (e.g. Japanese utilities). Under contracted buyers are purchasing spot cargoes (e.g. China). 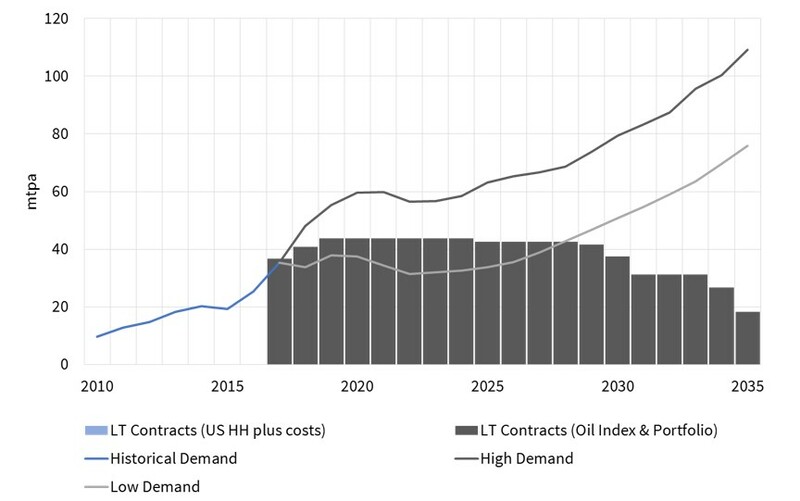 This is supporting a transition to shorter term LNG contracting and hub-linked pricing. It is also eroding the dominance of long term oil-indexed supply contracts. The top 5 buyers (Japan, Korea, Taiwan, China & India) make up more than 90% of Asian LNG demand (173 mtpa in 2016). Growth dynamics across smaller buyers (Thailand, Malaysia, Indonesia, Singapore & Pakistan) are strong, but these countries currently only account for 13 mtpa of demand. Chart 1 shows the historical and projected net long term contracted position of the Big 5. 2017 has seen strong demand growth (12% vs 2016), driven particularly by China. This has been consistent with a high Asian demand growth scenario. If growth were to continue on this trajectory then the net over-contracting of Asian LNG portfolios is likely to be limited. A low demand scenario could see a more than 20 mtpa surplus evolve over the next three years, much of which may be sold at European hubs. Note: Charts show future contract volumes as signed on an ACQ volume basis. In practice there may be some flexibility for buyers and sellers to negotiate lower contract volume take, particularly over summer periods. China is the key driver of Asian demand growth uncertainty. There is a credible range of 25 mtpa between low and high Chinese demand paths by the beginning of next decade, as shown in Chart 2. 2017 has been a strong growth year for Chinese demand, consistent with the high demand scenario. This has seen Chinese buyers actively sourcing spot cargoes this year. But that does not necessarily mean a further 3 years of growth at this pace to follow. Persistently high coal prices have helped support Chinese LNG demand this year. 2017 has also been important in the Chinese political cycle, given the lead up to the 19th National Congress which saw Xi Jinping consolidate his power. There has been a strong associated incentive for the incumbent Chinese leadership to support economic growth. Looking forward, the pace of Chinese economic growth remains a key factor. But LNG demand is also set to be influenced by a combination of coal price levels, pipeline volume take, responsiveness to prevailing LNG spot prices and a pollution driven policy shift towards gas. Beneath the net position of the big 5 buyers, there are some more substantial contractual imbalances in Japan and South Korea. Chart 2 illustrates this issue, with Japan facing a 15-20 mtpa contract surplus by 2019. The surplus of contracted LNG in Japan and Korea is driving a rapid commercial evolution amongst utilities. Buyers are trying to negotiate increased flexibility in legacy supply contracts e.g. allowing cargo resales and relaxing destination clauses. The ramp up in flexible hub-indexed US export contract volumes, with forward exposures that are managed against US and European hub prices. LNG market liquidity is also being boosted by rapid growth in the role of commodity trader intermediaries (e.g. Gunvor, Vitol, Trafigura & Glencore). These players are injecting innovation and expertise developed in oil and other commodity markets. This evolution of the LNG contract market is driving a virtuous cycle which is acting to increase the influence of hub price signals. It is also seeing Asian portfolios shifting their focus to the west, in order to access liquid US & European hubs to manage portfolio exposures.